Home > EW > "Sell those euros. Sell'em." 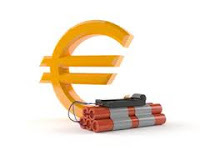 "The [Euro] surged to 1.0654 in overnight trading. Several financial stories were at a loss for the sharp rise. "No 'particular' news seems to be driving the euro's jump," says the head of forex sales at an Asian bank. Bloomberg called the jump a "Mystery Move." Even if the reasons behind it weren't clear, without a doubt many forex traders saw the 300-pip jump as the start of a bigger rally. But to our Currency Pro Service team it was clear it wasn't the start of anything. "Sell those euros," as the subject line said. You can see why: We saw the rally as the last gasp of a wave 2 correction. When last Thursday's "mystery" rally came up to within pips of a .618 Fibonacci resistance area, it warned us that the bottom was ready to fall out. (Last Price 1.0393): Good morning and welcome to our intraday coverage of the first New York session of 2017. We ended 2016 suggesting the euro might experience a rough start to the new year. It's down 1.10% since Friday. Also on Tuesday, a Reuters headline said: "Dollar hits 14-year highs after strong U.S. manufacturing data." If only the news could really explain everything. Learn how to put the power of the Wave Principle to work in your forex trading with this free, 14-page eBook. EWI Senior Currency Strategist Jim Martens shares actionable trading lessons and tips to help you find the best opportunities in the FX markets you trade. This article was syndicated by Elliott Wave International and was originally published under the headline "Sell those euros. Sell'em.". EWI is the world's largest market forecasting firm. Its staff of full-time analysts led by Chartered Market Technician Robert Prechter provides 24-hour-a-day market analysis to institutional and private investors around the world.